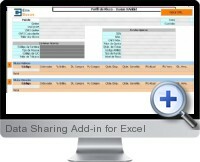 The Data Sharing Add-in for Excel (BROADCASTER) implements a real time network over Excel sheets. Data Transmission in Real Time - Function to transmit data directly from cells. Data Reception in Real Time - Function to receive data directly into cells. CoRTEx Network - Network to implement communication and sharing in real time with Excel.